20 meters only! K2 w/ internal battery, R7 vertical. Decided to participate from the field. Loaded up the K2, Batteries, Inverted Vee fed with ladder line, auto remote tuner and a Jackite 31 ft telescoping pole. Also lawn chair, small table and logsheet. Decided to set up on the fringe of an elementary school parking lot near home. I have set up there at least a dozen times before. Forgot tent stakes for the antenna. Took me an extra 30 minutes to figure out how to anchor those two ends of that inverted vee but I got all set up and was ready to roll 5 minutes after the event started for my time zone. Two employees from the school approached me. They were custodians. One of them informed me - now this is her story - that someone called the school district police and reported a man on the school grounds with a radio antenna. The key here was the antenna. The police then called the custodians and told them to come out and tell me to shut it all down. I think the custodians made the call. I had not even turned on the radio at that point. The girl offered to call the police office back to give them a better picture of what was happening. While she did that I made two contacts on 20m. Sounded like activity might be pretty good. But no luck tonight. I was told to shut it down and I did. MTR and amp; 1800 mAh Chinese LiPo to ‘Stealth nighttime-only vertical” (darned homeowner’s association) – Nice to hear 20 meters not only open late, but strong tonight. Some really good signals on the Sprint, including WB5BKL, K2YGM and W2LJ just pounding into Florida. Didn’t hear anyone on 40 meters but maybe I got there too late. Thanks and hope to see you next month. I have been homebrewing a SP radio since Feb. and just yesterday got enough bugs ironed out to be able to use it this month. It covers 20M only, xtal controlled TX, DC RX, internal PicoKeyer with HB micropaddles. It's in a clear plastic case and weighs only 5.2 oz. The battery pack is eight alkaline cells. Headphones by Sony. Whole station weighs 0.84 lbs. Antenna CFZ. After the first hour of the sprint, everyone disappeared - guess they went to 40M. But it was lots of fun using a homemade radio. I may get a LiPO battery for next month to cut the weight even more. Bands were good. OPs were great. Fun was abundant. I started on 10m and progressively moved through 15m, 20m then 40m, before I found one QSO with K7TQ in ID. Band conditions here in Central CA were very noisy due to lightning storms in progress about 30mi northwest of me in the San Joaquin Delta. I'm still using my weak battery in my K2, so this time I left my charger connected and added a pound to my weight. It really is a lite unit. I ran the whole 2 hours (I did take a few minutes out to check-in to a traffic net) this time and got 11 more contacts than my past few where I have been stuck on 16. I really appreciate everyone pulling my 1 watt signal out of the ether. I'm using a Mystery Antenna which I raised a few more feet today and now have the apex about 35-36 feet up. I got 13 on 20, 8 on 40, and 6 on 80, so 20 still seems to be the best and that should go up with summer and longer days coming on. Maybe next month I'll get my Wilderness Sierra out with my new AA NiMh batteries which just arrived and have a much lighter setup. It was a blast guys....thank you for all the contacts. There I was fiddling with the power setting on the KX3, calling CQ and seeing what RBN skimmers could hear my 1 watt signal when I get K4BAI coming back to me and making a contest like exchange. Cool! 1 watt makes the trip! Shortly thereafter, WB8LZG calls me and the same thing happens. Hmmmm. I glance up from the KX3 and notebook and see the RBN skimmers are logging a LOT of calls, many I recognize, all hanging around the 20 meter qrp watering hole. Ok, so what have I stumbled into? A quick check reveals I've literally stumbled into the May Spartan Sprint. Well, by this time, I've added W5ACM and N5GW to the log and I guess I am now participating in the May Sprint without even realizing it! Much thanks goes out to each and every one of the 10 stations that heard my 1 watt signal from central Arizona and put me in their logbook. All of the contacts I made were on 20 meters, even though I tried calling CQ on 40m. The last call in the log was with N5OBC with 13 minutes left to go (sorry Mark, I missed your call initially but got it sorted in the end). From what I could tell from this side of the Continental Divide, 20 meters sounded to be in pretty good shape. So my first ever Spartan Sprint is done. It catches me completely off guard and totally unprepared. How embarrassing! Regards to all from the Sonoran Desert. Still using the ATS-3. It worked flawlessly for the event. All of the CW errors were induced by the operator... 20M was sooo good, I got slow and complacent. I simply enjoyed the great signals and easy contacts from California to New York. You could say that I had become fat, dumb and happy. Yes, it was GOOD, and I enjoyed it! I finally migrated to 40M, but was surprised at the lack of contest operators. I worked W3KC on 40M, but no others until I found N4QA up the band a bit. It finally occurred to me that he was not in the contest, and in fact, the contest was long over! Oh well, it was an excellent QSO, and I did not include it in my total QSO count. Did I mention that N5XL and N4SX were only running ONE WATT?!? Thanks to the 20M conditions, they had excellent signals. Hoping for more of this in June! FT1000MP, 5W, TH6DXX, dipole, inverted vee. QSOs by band: 20: 19; 40: 20; 80: 4. Bands in good condition. Activity rather sparse. Thanks for all QSOs. 20M: QSOs from NH to WA to AZ plus KH6G and VE7OM (yes, worked W7OM too). First response was from G5LP in England, but couldn't get Lionel to send me his power, so he didn't count. 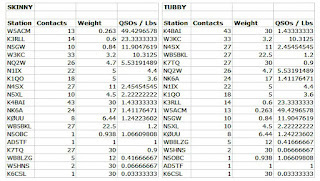 40M: QSOs from NH to CA and as close as N4SX, also in GA. 80M: NH, MD, GA, and TX. 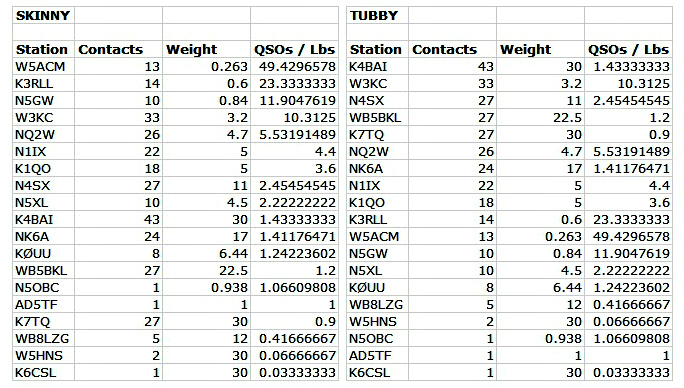 Lots more QSOs could be made if more stations were active and those who are active try all bands that could be open. Hope to meet many of you at Dayton. Ten Tec Argo 509 on gelcell battery fer power. at 4w to dipole up 35 ft. Not exactly "skinny" as the Argo isn't any KX1, es my battery is 6er7 lbs. total weight abt 10-12 lbs. Worked 5 stns on 20m in abt 1/2 a hr . N4SX , N7TX , N5XL, K4BAI , NK6A . Hope to CUL in next months SP Sprint. Wow...great signal from N4SX on 20M and 80M with 1 Watt in GA, you are an inspiration. It was very cool to hear Randy from ID, K7TQ on 40M, I remember Randy from the QRP Foxhunts and a lot of QRP contests...great to hear you last night (I think the last time I might have worked you was when I held the call AB1DR)!!!! Worked both N1IX (my neighbor) and K4BAI on 20/40/80. And this time I didn't miss NK6A, so cool to hear Don's FB signal from CA on 20!!! Always nice to hear my fox hunt buddy, W2LJ and worked him on 40. Cool to hear WB5BKL in TX. I also worked: K3RP, AB0TO, NQ2W, KQ2RP, W3KC and K2YGM. Tried a new setup for outdoor operating, hopefully for the ARS Bumblebee this summer; KX3 with AA batteries, Ipad with Pigtail and Bluetooth keyboard for logging. I apologize for a bit of QLF'ing when I started...the KX3 memory keys and the IPad was a bit much for me to handle so I went to Plan B and continued the contest. Many thanks to KI6SN for the Adventure Radio Society and these sprints and all of the FB ops who participate in this contest!!!! QRP'ers are the nicest and most patient hams in the world...it's so cool to be part of this group! Used my KX-3 and IPad/pigtail interface with the hamlog app. This combination really works well and is a great portable alternative for anyone who can’t use a paddle or key. I also used it for the QRP to the field event last week. All the QSO’s were made using my OCF dipole at 35 feet. Not very much activity early but it picked up after the first half hour. Eight QSOs on 20, eleven on 40 and three on 80. Worked N4SX on 40 and 80. He had a great signal using only one watt. He told me that I was his third NH QSO on 40. Happy to see that we were well represented. K1 running 5W to a mini-beam at 25ft for 20m and an inverted vee at 40ft for 40m. I think this maybe the most Q's for me during a Spartan Sprint. Ended up with 13 on 20 and 13 on 40. For the most part signals were quite strong on both bands. Had doubles with K4BAI, N4SX, and WB5BKL. Worked 2 SP'ers from Thunder Bay, ON on 20...that's never happened before...pretty cool. I wonder how many SP'ers have worked two stations from Albany, NY during a Sprint. All in all a very enjoyable time. Thanks to all. I hope to hear you all next month. K3/10 @ 5W to a wire delta loop, a dipole or a 40M extended double Zepp. 13 states this time, most of them on 20M. Worked only two stations on all three bands (20, 40 & 80M): K4BAI and N4SX. Only two stations using less than 5W this time, but N4SX was one of them! 80M was strange. K4BAI usually booms in here, but John was pretty weak and Terry was proportionally weaker. Removed one QRO station (at 9.7W) from my score, but will try to talk him into joining us next month! My thanks to all. Had fun. As a last minute effort I screwed my 20 m coil on the Hustler fold over whip got out the KX1 and Western Electric Mini key. I made one contact, and it was here in Oklahoma to a station a few hours away. Still fin and thanks for the sprint. Any one watt contact is way better than no contacts! I headed into the mountains east of Moscow, ID for the May SP. Gear included K2, G4ZPY paddles, 7 AHr battery, SOTA Beam 20/40 m dipole, and a Jacklite pole. Set up of the antenna took about 10 minutes. The temperature was a very pleasant upper 60s the entire time. I was able to watch the sunset which happened about the time the SP ended. 20 m was good with 17 Qs from the starting bell to 0145 Z when I changed to 40 m for another 10 Qs. 20 m covered CA to NY and 40 was good for CA to NH, so coast to coast on both bands. I got 6 ops on both bands, K4BAI, N4SX, NK6A, NQ2W, W3KC, and WB5BKL. This was the 2nd time I've used the antenna and it performed well. I hope to get out again in June.